The Union Cabinet on Wednesday gave its nod to the proposed merger of Vijaya Bank and Dena Bank with Bank of Baroda (BoB). The merger will be completed by April 1, to create the country’s second-largest public sector bank. The merged entity will also be the third-largest, in terms of assets, after State Bank of India (SBI) and HDFC Bank. The total assets of the three entities combined, as of September 2018, was Rs 10.44 trillion, trailing SBI (Rs 34.86 trillion) and Rs 11.70 trillion of HDFC Bank. BoB will be the transferee bank and Vijaya Bank and Dena Bank would act as the transferor banks, a statement from the government said, indicating that the larger bank will subsume the other two and would continue with its own identity. Hence, there is unlikely to be a change in name, even as the term preferred by the government and the banks is “amalgamation”. The boards of the banks met to approve the swap ratios on Wednesday. For every 1,000 equity shares of Vijaya Bank and Dena Bank, respectively, investors will get 402 and 110 equity shares of Bank of Baroda, according to a BSE notification. According to a senior banker with one of the banks, the government has not communicated how the top management would be placed in the merged entity. Dena Bank is headed by Karnam Sekar, Vijaya Bank by R A Sankara Narayanan, and Bank of Baroda by P S Jayakumar. Based on Wednesday’s closing prices, the share exchange ratio seems to be in favour of Bank of Baroda. 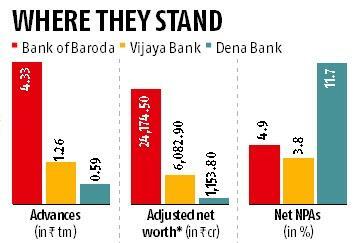 For Dena Bank, the ratio is at sharp 27 per cent discount, and it is 6 per cent discount for Vijaya Bank. According to analysts, the market was expecting that the share-exchange ratio would be slightly more in favour of Dena Bank. “By favouring the stronger BoB, the government has broken the market’s distortion of share-exchange ratio,” said G Chokkalingam, founder, Equinomics Research & Advisory. “It is also acquiring high-quality Vijaya Bank at around 15 per cent discount as compared to ratio of their adjusted book values,” Chokkalingam added. Dena Bank would also pull down the asset quality of the merged entity, analysts said. “The financials of BoB are likely to be diluted during the initial phase of the merger, mainly because of the bad loans of Dena Bank. Also, technology change, possible NPA (non-performing asset) provisions requirements etc. are likely to take a toll on near-term earnings of BoB” said Lalitabh Shrivastawa, assistant vice-president at Sharekhan. BoB’s stock is expected to react positively on Thursday’s, but Dena Bank could witness sharp pressure on its share price. Vijaya Bank stock may see some marginal pressure. BoB stocks closed Rs 119.40 a piece, down 3.16 per cent; Vijaya closed up 0.29 per cent, at Rs 51.05 a piece; and Dena Bank closed down 0.28 per cent, at Rs 17.95 a piece on the BSE. The combined employee count was 85,675, and total branches were nearly 9,500, as of June. “The amalgamation will be the first-ever three-way consolidation of banks in India,” the government said. It will “help create a strong globally competitive bank with economies of scale and enable realisation of wide-ranging synergies,” such as networks, low-cost deposits, customer base, market reach, operational efficiency while offering wider bouquet of products and services, and improved access for customers. The undertakings of Vijaya and Dena Bank “as a going concern shall be transferred to and shall vest in the transferee bank, including, inter alia, all business, assets, rights, titles, claims, licenses, approvals and other privileges and all property, all borrowings, liabilities and obligations,” the government statement said. Every permanent and regular officer or employee of Dena and Vijaya will become an officer or employee of BoB and their pay and allowances will be at par with other Bank of Baroda officers and employees, the statement said. “There will be no retrenchment of any employee because of this merger,” said Union Law Minister Ravi Shankar Prasad. The three banks have strengths of their own, Dena Bank has relatively higher access to low cost current and savings accounts (CASA), Vijaya Bank is profitable and is well capitalized and BoB has extensive and global network, as well as good product offerings.